Colby is the son of Linda Brice and Clark Miles. Colby is a first grade student at Faulk Early Childhood. Colby has one brother named Ricky. In his spare time, Colby enjoys playing with race cars. He also likes to play with his dogs Baby and Bernie and his five cats—Gary, Stuart, Ninja, TV, and Chloe. Colby’s favorite color is blue. He likes school because he gets to learn and do math. When he gets older, Colby wants to be a fisherman. 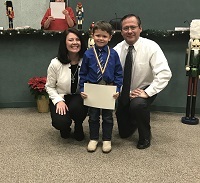 Colby was selected as “Panther of the Month” because he is a dedicated student. He follows the schools’ rules and tries his best when doing his work. Colby is a great teacher’s helper and a wonderful friend to all his classmates. Faulk Early Childhood is proud to have Colby Miles as their Panther of the Month. Olivia is a 2nd grader at Kieberger Elementary and is the daughter of James and Janice Bell. In her spare time, Olivia enjoys playing outside with her friends. Olivia’s favorite subject in school is art. She says they do such cool stuff. When she grows up, Olivia would like to be a cheerleader. Olivia was selected as "Panther of the Month" because she is a hard worker, is always willing to help others in class including her teachers, and is always a sweet young lady. 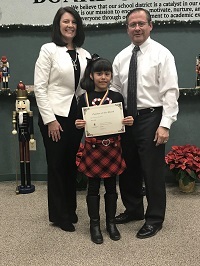 Kieberger Elementary is proud to have Olivia Bell as their Panther of the Month. Miley is a 4th grader at CMES. She is the daughter of Richard and Latisha Herrera. Miley has two brothers, Richard and Tyler, and one sister named Katrina. Miley’s favorite color is purple and she likes to spend time with her family. Her favorite subject in school is science. She likes school because she can learn and be with her friends. Miley wants to attend college to become a marine biologist so she can work with dolphins. Miley was selected as “Panther of the Month” because she is always respectful and always puts others first. We are very proud of her hard work and dedication. Please join us in congratulating Miley Herrera. 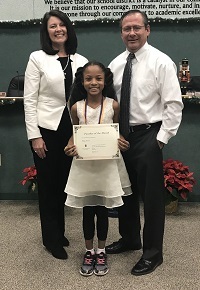 She is one of the many bright stars we have at Charlie Marshall Elementary School. Raistlin is a 6th grader at A.C. Blunt Middle School. He is the son of Alison and David Wiemken. Raistlin is the youngest of five boys. Raistlin has four dogs, but his favorite dog is Piggy, his pit bull. His favorite class in Pre-Athletics because it is making him a better athlete and a better student. His favorite things to do when he is not at school are hanging out with friends and playing video games. When he finishes school, Raistlin wants to go into the military. Raistlin Wiemken was selected as “Panther of the Month” because he is a hard and enthusiastic worker. He was nominated by his teachers because he always follows the rules, makes good choices, and is a good example for fellow classmates. A.C. Blunt Middle School is proud to have Raistlin Wiemkin as their Panther of the Month. Thomas is a senior at Aransas Pass High School. Thomas loves to be involved at school, he’s been his class president for all 4 years and he is also an editor in chief for his school’s yearbook. Thomas said that he currently loves to create yearbook spreads, photographs, sick tennis matches, and friendships, and one day he hopes to create buildings. He plans to pursue a master’s degree in architecture at UTSA (University of Texas at San Antonio). He applied last week and he’s hoping to hear good news soon, he said “Please keep your fingers crossed for me” and “if this college doesn’t work out, I wouldn’t mind if a few of you wrote me a recommendation letter”. Thomas was selected Panther of the month at Aransas Pass High School because of the hard work and dedication he exhibits. Aransas Pass High School is proud to have such a great student.